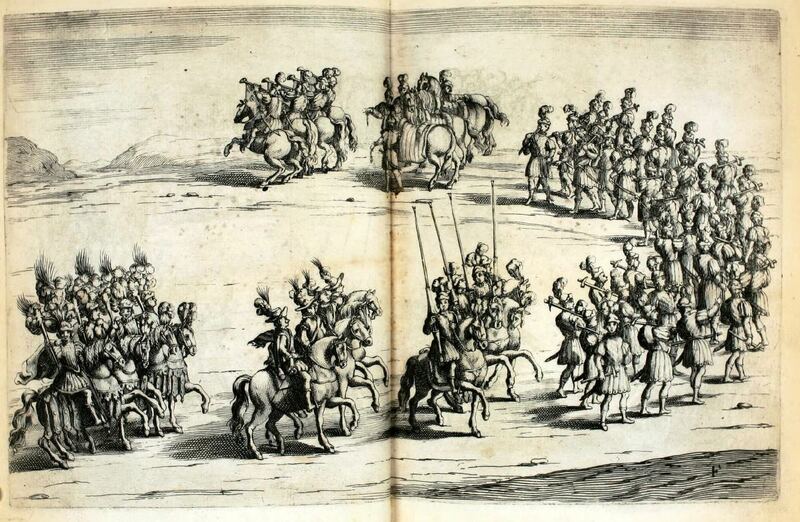 In the first part of this article we analyzed the rules of the Saracen Joust in the seventeenth century. 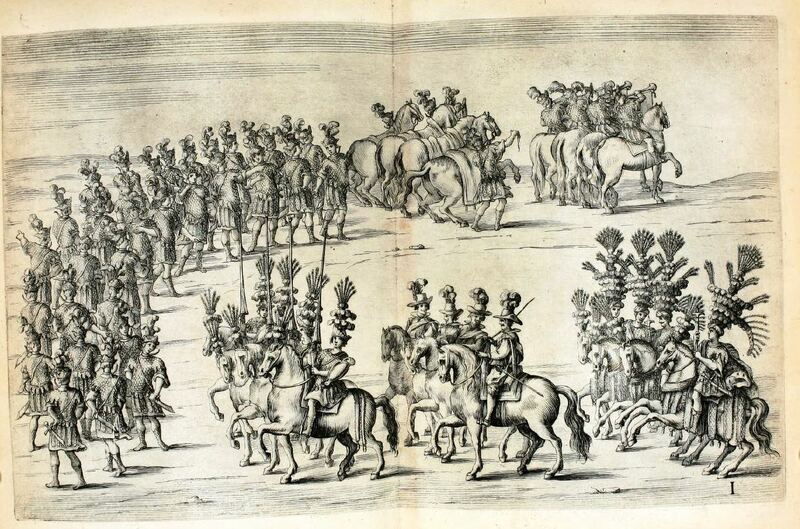 In this second part, we discover the complex dramaturgy of these types of equestrian festivals of the Baroque era. 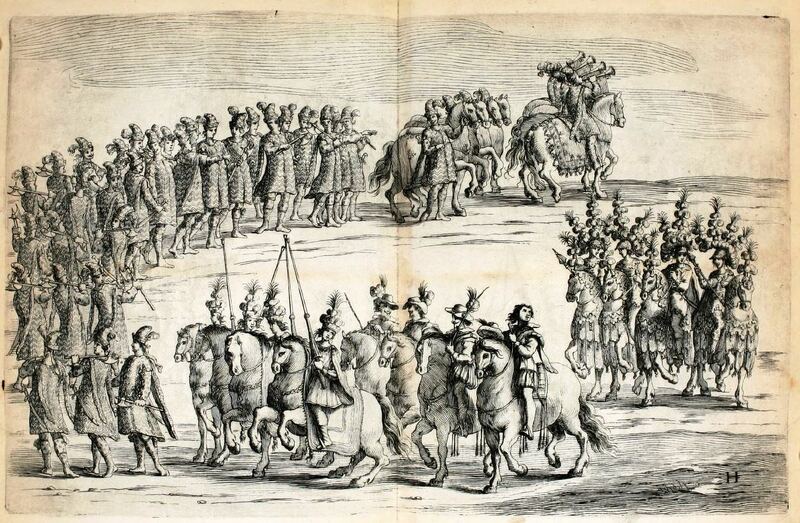 Since the Renaissance, jousts and tournaments undertook eminently theatrical features. They were carried out following a literary plot, which included a prologue and an epilogue that constituted the spectacular and narrative frame in which the chivalrous trials took place. In the days preceding the contest, a knight, the so-called “Maintainer”, presented his cartel. 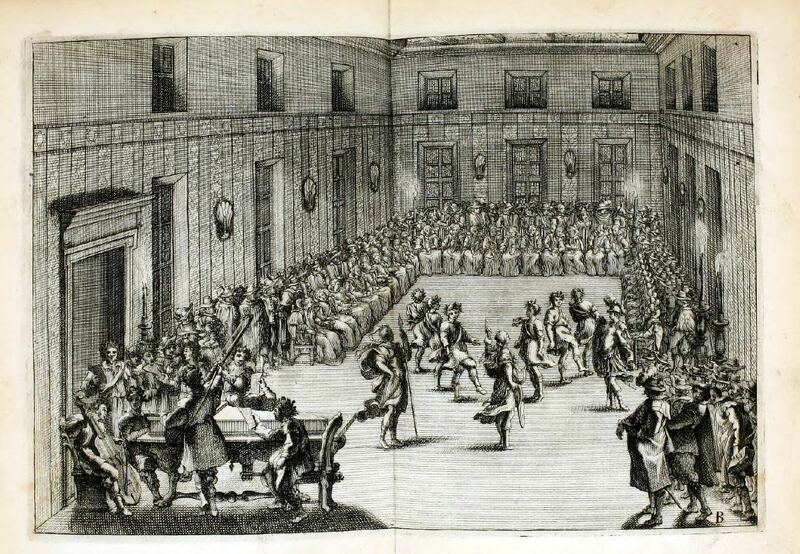 This usually took place during a show in which sonnets were recited and music and dances were performed. Generally, the Maintainer impersonated a fairy-tale character of exotic origin. 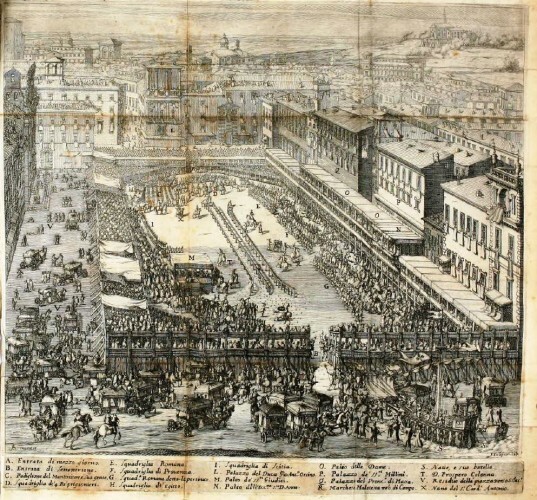 In the case of the joust in Piazza Navona, the role of the Maintainer was attributed to Marquis Cornelio Bentivoglio, who was considered a great expert in matters of chivalry and was the nephew of Cardinal Guido, who was the chronicler of the joust. Cardinal Bentivoglio’s very detailed account of the Joust and the beautiful drawings by Andrea Sacchi, which enrich the 1635 edition, offer us the opportunity to discover and “see” the complex and very interesting dramaturgy of this kind of equestrian festival in the Baroque era. that secrecy in love is a superstitious abuse, who supposes or lack of merits of the Lady, or poverty of spirit in the Knight (BENTIVOGLIO, 1654, p. 201). The presentation of the mysterious character of the Maintainer, and the challenge he launched thus, represented the fabulous premise of the joust and placed it within a rich texture of symbolic cross-references to the aristocratic and courtly culture and the chivalric imagery. 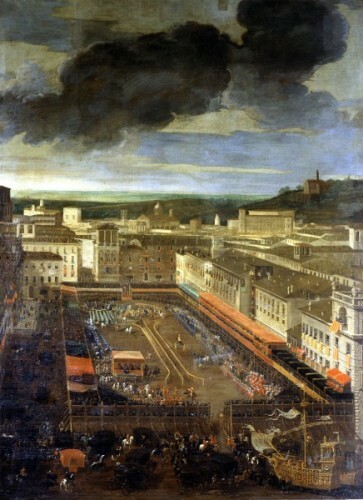 In the following days, in Piazza Navona, the fence for the joust was prepared, surrounded by boxes and tiers of seats. It occupied about two-thirds of the square, which stands on the ruins of the Diocletian’s stadium and preserves, in part, its shape. The boxes and the stands for the public were placed at a certain height, so that horses and operating personnel could be placed below, without disturbing the audience. The box for the ladies was set up right across from the Saracen dummy, and was accessed directly from the Mellini Palace (later incorporated into the Pamphili Palace, which still overlooks the square). The box, covered and lavishly decorated with rich fabrics, was intended first and foremost for Anna Colonna, the wife of Taddeo Barberini, the brother of Cardinal Antonio Barberini, and for Costanza, who was the mother of the same Cardinal. Beside them sat, in an order of precedence established strictly according to their rank, the wife of the ambassador of Spain and the other ladies of the Roman nobility. The stage of the judges was, instead, placed on the opposite side of the fence, inside the competition area. The whole arena was surrounded by stands for the public. The race course was of an octagonal shape. The career (i.e. the track on which the horses run during a joust) consisted of a double fence, divided by the lists and was paved with bricks. Finally, to the right of the theater’s southern gateway, there was the Maintainer’s pavilion: a rich marquee, from where the challenger watched the competition, surrounded by his retinue. On the morning of Saturday, February 25, 1634 people began to crowd the boxes and the stands around the competition field. Many high-ranking personalities attended, leaning out of the windows of the buildings, while their servants and common people crowded on the roofs of the palaces. When the ladies and the judges took their places in their respective boxes, the festival began. The teams of knights, accompanied by their seconds and by a large cortege of pages, grooms and trumpeters, made their entry into the field, following a strict order of succession. The view was magnificent, considering that three hundred and sixty people, and a hundred and thirty eight horses, took part in the show. The first to be received by the Master of the Field was the Maintainer. He was dressed in a sumptuous green silk costume, embroidered in gold and decorated with many pearls and precious stones. He had a giant feather headdress, with a sun and the motto “Non latet quod lucet” (“what shines is not hidden”) in the center. The horse’s harness was just as rich and exotic. He was preceded by a procession made up by four trumpeters, six horses led in hand, twenty-eight grooms on foot and four pages on horseback who were carrying baskets from which they distributed printed copies of the cartel and of various sonnets. They were followed by the seconds, Don Prospero Colonna and the Count of Castel Villano, and by a page who carried the spear and the shield of the Maintainer. The magnificence of the clothes and of the rich harnesses of the horses had a great importance in this kind of show. This is demonstrated by the fact that, at least since the Renaissance, the very detailed description of the quality of the fabrics, the style of the clothes of the riders, and their retinue, took up pages and pages in the chronicles of jousts and tournaments, even being the largest part of the chronicles. These parades, in fact, represented an opportunity for the public expression of the power of the aristocracy. The noble wanted to dazzle the people with showy and flashy clothes, made with rare and precious fabrics. On the other hand, the showing off of wealth by the nobles was not directed only to common people, but also to their peers, in a competition for which they were ready to spend huge sums, in some cases up to getting into debt and ruining their finances. But it was not always gold that glittered. In some cases, the showy trappings of pages and footmen were made, as real theatrical costumes, with the poorest materials, such as papier mâché and plaster. 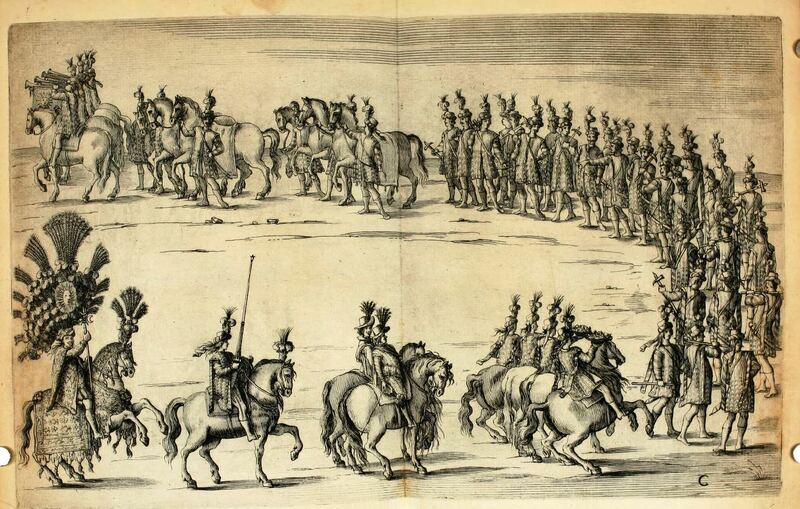 When all the riders had run against the Saracen, the Master of the Field ordered them to made another parade before the audience. Finally, the blare of trumpets announced the trail of “the spear of the Lady”, a sort of special prize, which consisted of a jewel studded with diamonds, placed in the middle of a bunch of red roses, offered by Anna Colonna. During this trial, twelve knights hit the dummy in the front and then resulted at an equal score. The judges therefore decided to draw lots for the winner. After the end of the trails, the knights kept in showing off, demonstrating their skill before the audience. In particular, the Maintainer charged the dummy holding a spear in each arm and driving the horse with the reins between his teeth, finally hitting the target with both spears. Then he ordered to tie together three spears and charged and hit the dummy with them, nearly cutting off his head. His superiority over his rivals in the chivalric trials was overwhelming, so much so that he won sixteen awards. These were jewels that the knight gave as a present to the most prominent ladies, as a sign of gallantry. In addition to the prizes awarded for the chivalrous trials, each joust also included a prize to the squadron that was judged the more elegant and with better bearing. It was the so-called Masgalano (from the Spanish “mas galante”, i.e. the more gallant). This prize still survives today in the Palio of Siena, in which it is awarded to the contrada whose “comparsa” (i.e. team) is considered the most “elegant”, during the parade that precedes the race. 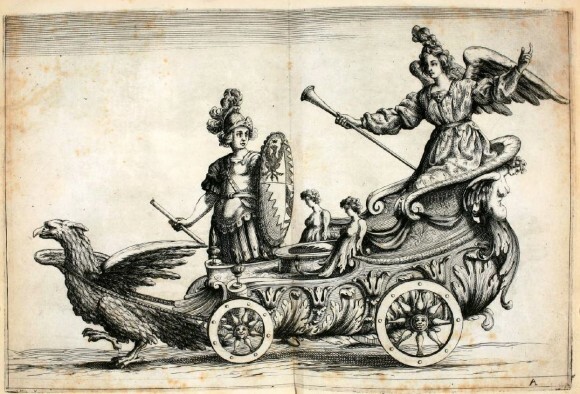 In the Joust of Piazza Navona the prize, offered by Cardinal Barberini, consisted of a magnificent silver sword and a beaver hat, gloves and other ornaments. The judges were the Ladies, and they decreed an ex-aequo among the knights of the First Squadron (the one of the four Kings) and that of the Provençal knights. It was decided to elect a champion for each team, who had to run three times with his spears against the Saracen, to determine the verdict. The winner was Ambrogio count of Carpegna, of the Provençal team. The entire show lasted over five hours. When it was beginning to get dark, some cannon shots were heard. Then two chariots entered inside the fence: one shaped like a ship, the second in the form of a boat. The first was richly decorated with the emblems of the Barberini and the Colonna (at the time, the two main noble families in Rome). 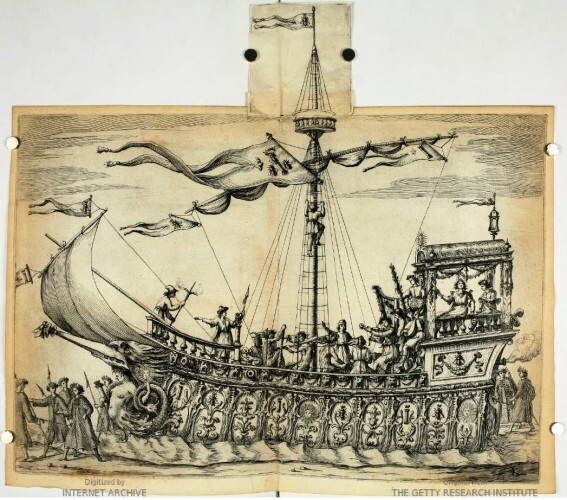 The ship was armed with cannons and fireworks and carried actors impersonating the god Bacchus, accompanied by the Laughter, bacchantes, satyrs, shepherds and gunners firing blanks with cannons. 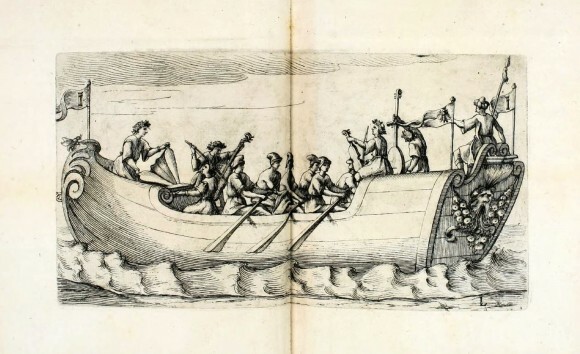 The boat was, instead, carrying several musicians, who held a concert under the box of Anna Colonna and of the Marchioness of Castel Rodrigo, wife of the Spanish ambassador. 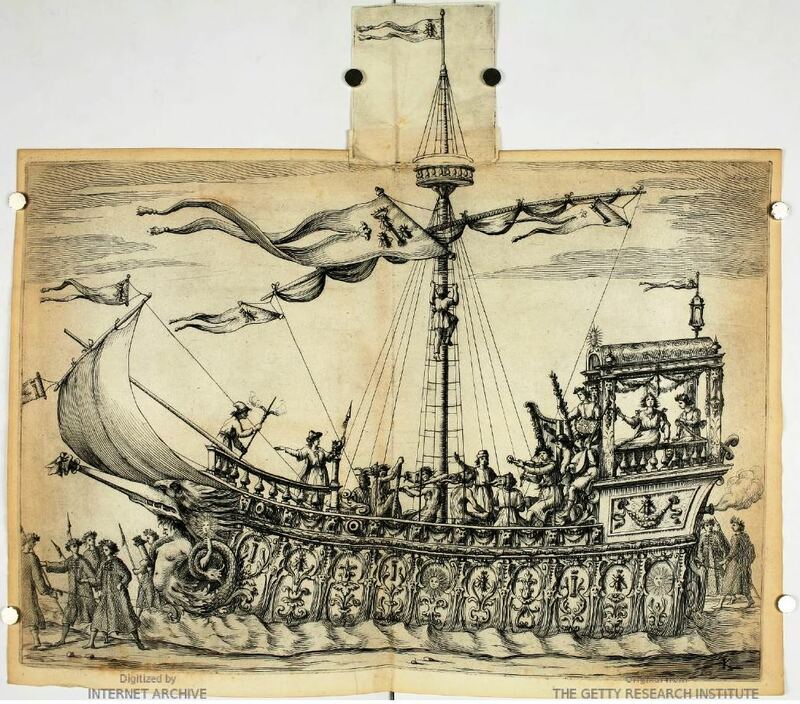 The spectacle of the Ship of Bacchus excited such wonder that the people demanded that it was exposed, so that even those who had not attended the joust could come to admire it. And so it was done, while the ladies and the knights spent the evening at the reception hosted by Cardinal Barberini, in the Palazzo Mellini, which overlooked the square. 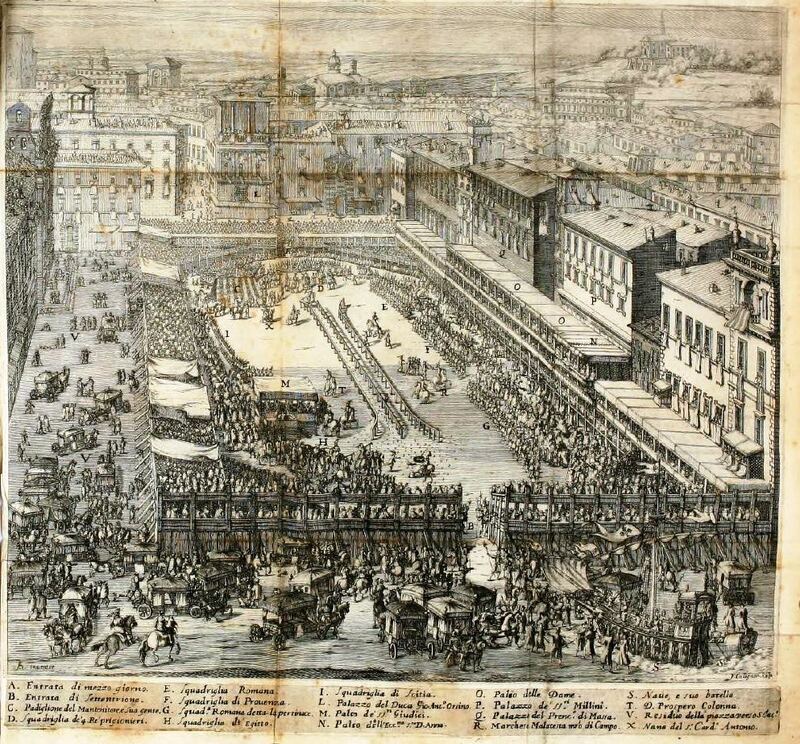 ADEMOLLO, Alessandro, Il Carnevale del 1634 in Piazza Navona, in Il carnevale di Roma nei secoli XVII e XVIII : appunti storici con note e documenti, Roma, A. Sommaruga, 1883, pp. 23-58. BENTIVOGLIO, Guido, Festa fatta in Roma alli 25. di febraio MDCXXXIV, in Roma, data in luce da Vitale Mascardi, 1635. 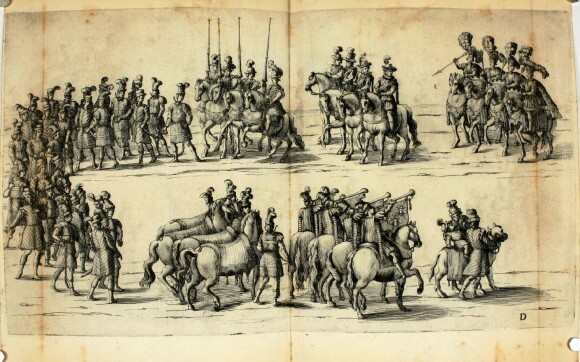 LIBERATI, Francesco, La Perfettione del cavallo, Roma, per Michele Hercole, 1639 (2° ed. Roma, 1669).